Talk about your basic last minute addition to the Unknown God tour...I'll be going to San Antonio this weekend for the Texas Comic Con. Hope to see any of my south Texas friends there. I wanted to share a bit about what I've been doing between my convention stops at Heroes Convention and the Philadelphia Comic Con. First of all I had an opportunity to get back on line, thanks to the generous offers from Best Buy and got a fairly decent Compaq laptop (which I believe in now a part of HP) for less than $400. Then I've taken the four days between events to literally stop in each major city between Charlotte and Philly, to visit and leave book samples with as many comic shops as feasible (thank God for Google Maps....a few years back this kind of thing would have just been too labor intensive to put together)! Being a former retailer myself, it's always a blast to see the very different character of shops around the county and how different they can be right within the same city...as well as how the store owners/mgr's greet and deal with people who walk into their stores. I'm happy to report that out of the 30 odd stores I visited, only one shop (and store owner) was rude to me and wouldn't even except my book sample (he told me he doesn't sell anything over $10...and all the Eye Witness books were $13.99 SRP). Yeah right! But as a professional courtesy I won't name the store, but only let you know it's in Raleigh. One final note. During one of my two days in the Washington area, I decided to do a bit of sightseeing, since I had never had the opportunity before in our nation's capital. Coming into the city I lucked into a parking place right along one of the main streets next to the Washington monument and better yet, it was free parking....score! I went on my way to see the Wash. Monument, toured the Smithsonian Natural history Museum and made myself walk the approximate 1 mile distance to the Lincoln Monument(which I just had to see). During that last hike I made a point of making sure all was well with my vehicle and making sure there it was still where I left it. It was. On my way back to my truck though, I noticed a lack of cars parked along the street I was parked on and became concerned. A brisk walk ended up becoming a jog, which turned into an outright sprint, when I saw several motorcycle cops along the block where I was parked and only a handful of cars still parked. Yikes! I was in full panic mode as I was sure the spot where I left my truck was now vacant, but kept sprinting forward as I saw there was a blue vehicle up ahead (but it looked like a van). But I kept running forward just in case (rather than stop and talk to the cops) and to my relief it was my truck and the tow truck was lining it up to haul away next!!!! I ran up and told him in a breathless manner, "Dude, that's mine,"...and to my total surprise he just said, go ahead and take it! I soon learned that where I was parked was legal parking, that is until 4:30 to 6pm...and at that moment it was 4:45pm. Wow...what a bullet I dodged. That would have put a serious black cloud over this trip if I would have just taken my time to get back to the spot. The first stop in the Unknown God tour is now behind me. I started the trip out on a dubious note by having my laptop die on me the first night on the road. But truth be told, it was a 10 year old Compaq who had served both me, my wife and my daughter faithfully...so I think you could say it just died of old age. Our first stop, Heroes Con in Charlotte, was wonderful on a couple levels. First of all I got a chance to reacquaint with a lot of old friends in the comic industry (Brian Stelfreeze, Gary Fredrich and Bernard Chang to name a few). Secondly, I was pleasantly surprised by how many of my Facebook friends stopped by to say hello (and pick up a copy of Eye Witness). 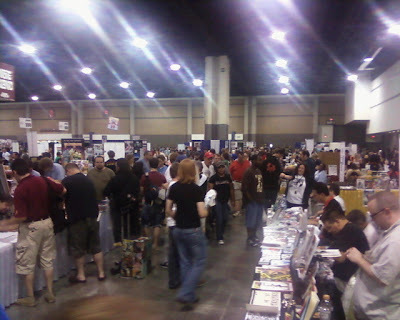 The show was a bit slow on Friday and Sunday, but Saturday had a pretty strong turnout...as you can see from the pics I've included in this post. This show is defined by it's old-school style in that it is a comic convention that actually still focuses on comics and comic creators. 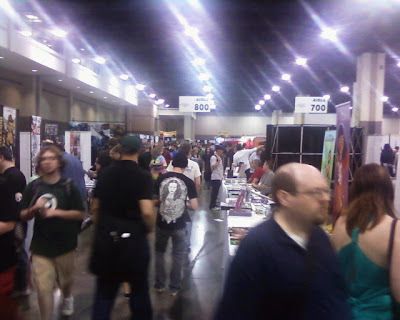 There was many, many talented creators and their indy creations on hand, but at shows like this...when I'm on my own...I just didn't get much of a chance to visit many tables. But I must say if you want to relish in all things comic related, I'd add this convention to your schedule next year! Advance cases of Eye Witness: Unknown God arrived last night at 8:30pm (nothing like cutting it close...thanks UPS for that ulcer). So I'm off to Heroes Con this morning for the Unknown God World Premier! I'm at... AA737, so make sure to look me up if you're attending! FYI...I give Josten's Printing a big thumbs up of the quality of their job, their customer service and the speed in which they worked (contact me if you need a referral). Hope to see ya' all in Charlotte this weekend!